How was your weekend?? Did you celebrate with family and/or friends?? Now that we are though the holiday rush, hopefully we can have some more time to craft. I know that my scrapping room needs some cleaning. I have been creating projects for family and friends without much time to clean up the mess, so this week, I am going to spend a little time getting things cleaned up and better organized so that I can start the new year fresh. Today, I am sharing a project with you that I created from the Winter Lace cartridge that ScrapbookPal sent me to work with. I created this frame that I gave as a gift on Saturday. Cut the background piece to 8 x 8 from a light colored turquoise cardstock. Cut 9 different snowflakes from the Winter Lace cartridge at 1 3/4 inches with some white cardstock (I used a pearl finished cardstock for my cuts). 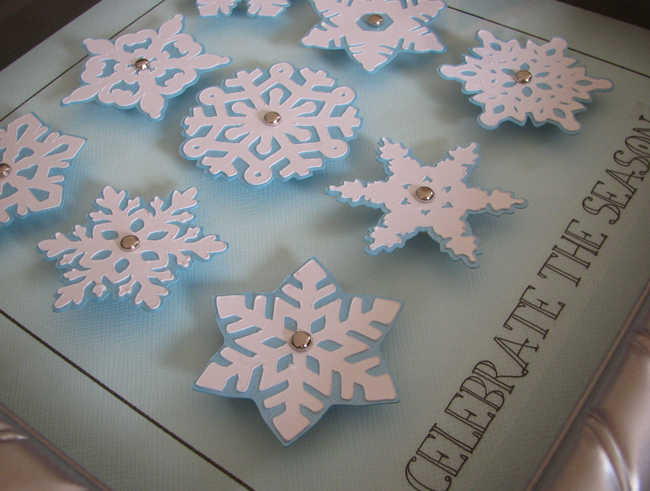 Cut the background layer out of a darker turquoise cardstock and adhere the snowflakes to their background pieces. Draw a line with a black pen about one inch inside each edge of the background cardstock for a border (leaving the bottom open for a sentiment). I used a sticker sentiment from SRM for the bottom border. Attach this to the inside of the back piece of the frame. 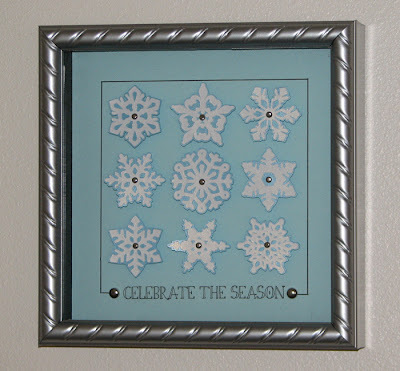 Add silver brads to each side of the sentiment and little ones to the center of each snowflake. 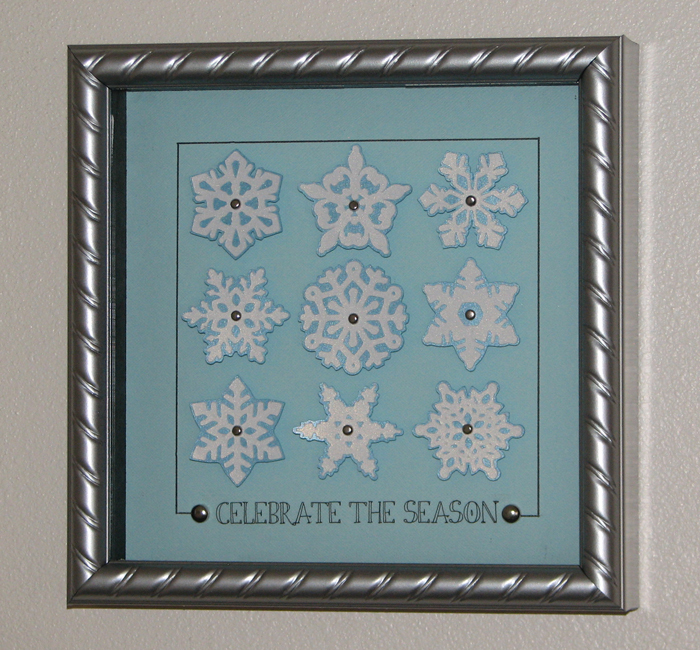 Arrange the snowflakes inside the black maker border as shown above. Layer with dimensional adhesive. I stacked two pieces of dimensional adhesive under each snowflake. I hope that you have a happy and crafty New Year!! Very nice art for the wall! Oh, this is really pretty and unique! Great idea! This is really cute! I have the same cartridge and haven't used it yet! Thanks for sharing your project.